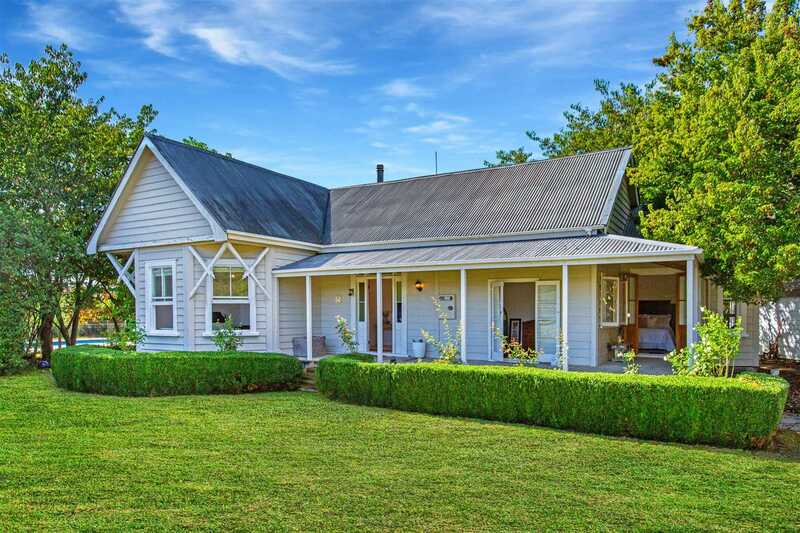 Positioned on a generous 4393m2, section you'll fall in love with this classic country character home. Imagine the welcome home afforded by the canopy of cherry trees when they blossom in the upcoming spring months. This greeting compliments the large front lawn, an ideal space for children to run around playing or perhaps training for any upcoming keen All Blacks. Meandering along the front veranda, your attention is drawn to the original stained glass panels surrounding the front door. The entrance into this home is warm and inviting. Inside, the main living areas are all sun drenched, the bi-folding doors enabling you to enjoy the warm rays while looking out over your private rural vista. The heart of this open plan home is the family sized kitchen and dining where many yarns will be shared over the dinner table. The extra living room complete with a log fire offers the perfect spot to cosy up and enjoy a good book and hot chocolate in the upcoming winter months. The well-proportioned bedrooms are all set away from the main living areas, and you'll have a hard time deciding who gets which bedroom as each has its own unique features such as French doors leading out to the front veranda, or a large bay window screaming out for window seating. The bathroom caters for the whole family with the separate shower and an inviting claw foot bath to soak away the days. Sprawling out from the living areas, the north-east facing entertainment area complete with decks, soft lawns and inground swimming pool assures endless fun in the warmer months. This location couldn't get much better too, this quaint rural village an easy commute to Morrinsville, Cambridge or Hamilton. School zones are excellent with Tauwhare Primary School just a 600m stroll away and you're spoiled for secondary school choice with either popular Hillcrest High School or Cambridge High School. Only a 10 minute drive to the retail and hospitality facilities in Hillcrest, you have the local sculpture park and Waitakaruru Arboretum an easy distance from your front door. Our current owners have loved this home for many years but have fallen in love with another, so this must sell. View this fantastic opportunity to snap up an entry level lifestyle property today. Call Katrina to arrange a private viewing or simply pop into one of the advertised open homes.